Best Badges Ltd: Calling all Guiding fundraisers - we’ll help design your badges for free! Calling all Guiding fundraisers - we’ll help design your badges for free! Many Guiding groups raise money for charities, and fundraising badges are a brilliant way to help with these campaigns. Badges are very easy to order, and when it comes to designing the perfect patch, we’re here to help. 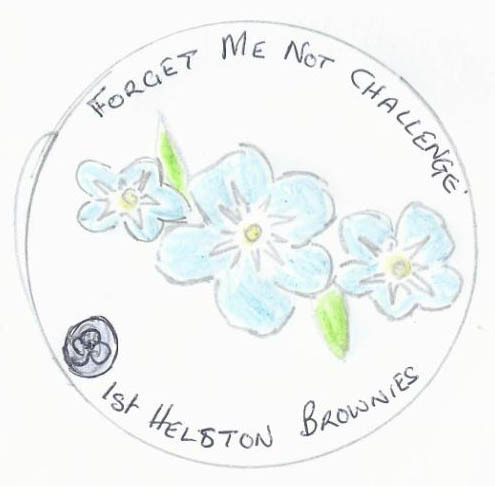 When Emma from the 1st Helston Brownies contacted us looking for a badge to accompany the ‘Forget Me Not challenge’ for the Alzheimer’s Society she already had a great design idea. Emma was aware that the badge had to look really great, and had to be at a cost low enough to maximise the amount of money that would be raised for this great cause. The fundraising efforts would be part of Emma’s Queen’s Guide Award, so it was important that the badges were really effective. Emma sent us the design as a pencil drawing of the forget-me-not flowers, with lettering above and below, and the Guiding trefoil positioned by the unit name. The trefoil needed to be matched to the official Guiding blue colour of PMS 2718c. The challenge name and unit name both needed to be prominent in the design. From the drawing, our designers quickly created a formal design proof and sent it to Emma for her comments. The proof is a picture showing exactly how the final badges will look, including colour references for each of the threads. To accommodate the perfect pantone colour matching, our designers recommended woven badges. When Emma at 1st Helston Brownies saw the proof she had the opportunity to give feedback and to address any ideas for improvement. We offer unlimited artwork changes for free, so the design can always be adjusted until it exactly matches what our customers have in mind. When the final proof was signed off we set to work making some woven badges that would be a real asset to the Forget Me Not Challenge, and to the 1st Helston Brownies. The finished badges were a great example of how well a badge can support a fundraising initiative. Everyone here at Best Badges and 1st Helston Brownies agreed, the badges were a brilliant success! Your badge idea is only the start! If you have an idea for a great Guiding badge then don’t worry about complex artwork specifications, just show us your ideas and we’ll use our expertise to make you a badge worthy of any occasion or achievement. It’s all part of the service, and helping Guiding groups design brilliant badges is something we really enjoy.